FILE - A military honor guard prepares for U.S. Chief of Naval Operations Admiral Jonathan Greenert's visit with Commander in Chief of the PLA Navy Adm. Wu Shengli at a welcoming ceremony at the PLA Navy headquarters outside Beijing, China, July 15, 2014. China's navy chief told his U.S. counterpart it was "dangerous and provocative" for Washington to sail a navy destroyer this week near artificial islands built by Beijing in disputed parts of the South China Sea. The comments came during a hastily arranged hour-long video teleconference Thursday between Admiral John Richardson, the U.S. chief of naval operations, and Chinese Navy Admiral Wu Shengli. U.S. defense officials described the talks as professional and productive, and said both sides agreed to maintain regular dialogue and stick with protocols to help avoid clashes. Chinese officials, however, described the talks in more grim terms. 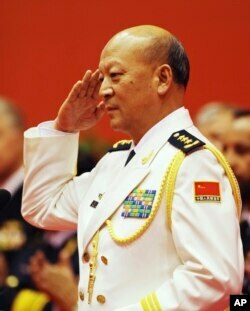 FILE - China Navy Commander Adm. Wu Shengli salutes after he made a speech duirng an opening ceremony to mark the 60th anniversary of the founding of the Chinese People's Liberation Army (PLA) Navy at Qingdao Port. "Such dangerous and provocative acts have threatened China's sovereignty and security and harmed regional peace and stability," said Wu, according to a Friday report in China's state-run Xinhua news agency. Washington on Tuesday took its biggest step to date to challenge China's claims in the South China Sea, sailing a U.S. navy warship within 22 kilometers of man-made islands in the hotly disputed waters. 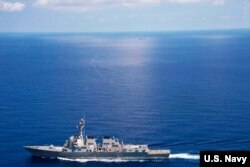 Beijing, which claims most of the South China Sea as its own, responded angrily calling the trip a “deliberate provocation” and filing a formal protest to the U.S. Ambassador in Beijing. Online commentaries since the trip have been heated, with some urging the Chinese military to ram U.S. vessels if they return and others calling for a military response over the dispute. Some have argued that China’s leaders need to be more like Russian President Vladimir Putin in protecting their country’s interests. Despite the tensions, a planned visit to China by U.S. Pacific Command Commander Admiral Harry Harris and U.S. Pacific Fleet Commander Admiral Scott Swift remains on track, according to U.S. officials. The Communist Party-backed newspaper Global Times ran a front-page story Thursday that said Admiral Harris is slated to visit Beijing on Monday, November 2. However, a Defense Ministry official said Thursday that the two sides are still working on a final date for the visit. USS Lassen (DDG 82) operates in international waters near the Chinese People's Liberation Army (Navy) Jianghu V-class frigate Dongguan (560) while on patrol in U.S. 7th Fleet at South China Sea, Sep 29, 2015. It is not just the U.S. Navy that is increasing its engagement with China. A French frigate is currently on a four-day visit to China’s main South China Sea base in the southern province in Guangdong. And next week, two Australian warships will hold exercises with the Chinese navy in the South China Sea. Australian media have reported that the exercise will include live-fire drills. And Australian military officials have said there is no sign that China plans to delay or change the schedule for the drills. On a visit to Beijing Thursday, German Chancellor Angela Merkel urged China to resolve South China Sea disputes in international courts. Merkel also said that it was important that sea trade routes remain open. China is unlikely to accept such a view as it has long rejected efforts for international intervention in the disputes. Instead, Beijing favors holding bilateral discussions with other claimants. More than $5 trillion in trade passes through the South China Sea each year where Vietnam, Brunei, the Philippines and Taiwan also have rival claims.